Over time, the kitchen has become more of a communal space, where visitors are encouraged to sit and socialise. While the living area might seem more comfortable and inviting, modern-style kitchens display a more attractive openness; one that facilitates conversation by removing the distraction of television or gadgets. Chairs tend to be assembled around an open table, rather than gathered around a wide-screen box, and guests are encouraged to eat and drink, without fear of dropping crumbs down the side of the leather sofa. Black and white has been seen as a modern and functional option for a long time, but in smaller kitchens, black can be too dark and confining. While white kitchen units are still popular, they are now more often combined with grey features, which soften the harshness of the white, while still giving the impression of a more spacious area. The sink was possibly the most uninteresting aspect of any kitchen space, traditionally made of cheap materials and free from personality. 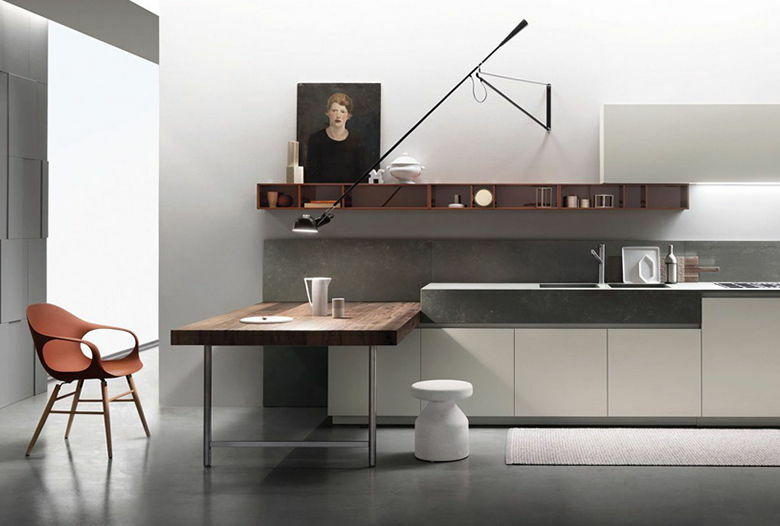 The latest trend sets out to change all this, making the sink a focal point of the space instead. Beautiful ornate taps can add a real class to your kitchen, while a sink on your kitchens island can add an additional social space as seen in our Barrique range. Good lighting can really open up any kitchen space, making it feel bigger and warmer. Light fixings in kitchens are often over-looked, but they can provide an interesting dimension to a kitchen, drawing the eye upwards and adding an attractive aspect. Spotlights may be functional, but big, bold light fittings can add a homely edge to a monochrome room and really set a mood. Storage space is a concern for most people, but there are some clever tricks that partners have come up with to create more hidden areas for pots, pans and kitchen appliances, while keeping the space looking tidy. Multi-tiered drawers are a popular option, often custom-made to certain requirements. Ernestomedia are a company with many innovative ideas, such as cupboards specifically in-built to contain fold-out tables; drawers underneath the sink for dishcloths and washing-up liquid; and recycling bins that tuck neatly away. Most contemporary kitchens feature an island in the centre. If the space allows, this design aspect provides an extra workspace for food preparation, as well as creating a communal feel. A host can talk to their guests as they chop vegetables, rather than standing with their back to them. Updating your kitchen may feel like a daunting idea, but as the central point of a home, it can create a more welcoming atmosphere for your family and their guests. Living Space partners with the best Italian Kitchen manufacturers and our highly experience interior designers are on hand to create the perfect bespoke kitchen space for you.